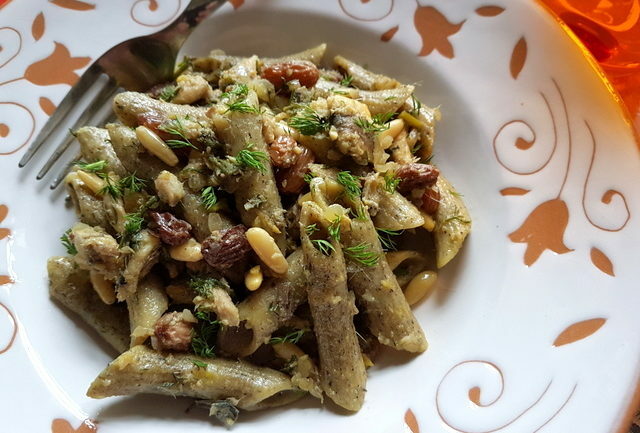 Sicilian pasta with sardines and wild fennel is a delicious fusion of ingredients from Arab and Mediterranean cultures and a reminder of Sicily’s fascinating history. 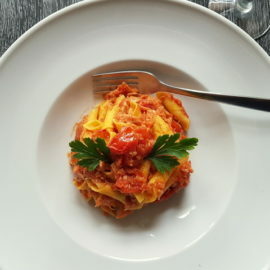 Called ‘pasta con le sarde’ in Italian and ‘pasta ch’i sardi’ or ‘pasta c’a munnizza’ in Sicilian dialect, pasta with sardines and wild fennel is one of the most well-known Sicilian pasta recipes. In fact, it is recognized as a traditional Italian food product in an Italian government scheme to promote traditional foods called PAT (Prodotto agroalimentare tradizionale). Although traditionally considered to be from Palermo, pasta with sardines and wild fennel is eaten all over Sicily. In some parts of the island, they add tomatoes or almonds. In other parts, they don’t use saffron or tomatoes. 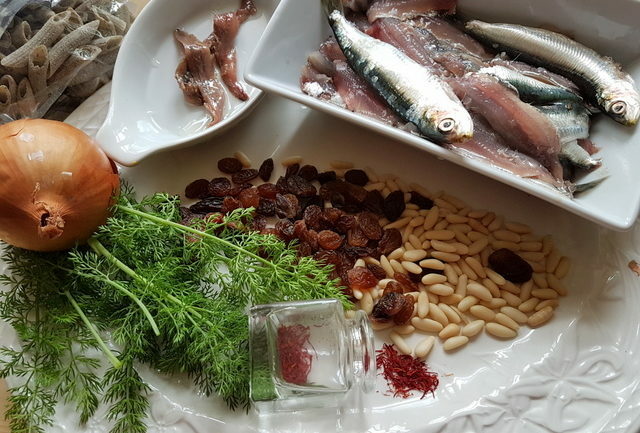 But, in general, the recipe calls for fresh sardines, anchovies, sultanas/raisins, pine nuts, saffron and wild fennel. Some pasta with sardines history. Sicilian pasta with sardines has ancient origins. Food legends tell us that it was prepared for the first time by the Arab cook of Eufemio da Messina. Da Messina was the ex-commander of the Byzantine fleet. But, had been accused of kidnapping and marrying a nun by the Byzantine emperor. Da Messina fled to Africa, where he joined forces with the Saracens and then, returned to Sicily to seek revenge for charges he considered false. On June 14th 827, Da Messina sailed to the southern coast of Sicily. After a 3 day storm he arrived in Capo Granitola bay. The Saracen sailors were exhausted and seriously hungry and needed a meal before entering into battle. The ship’s cook, whose name was never recorded, had to feed those hungry sailors. But, there weren’t many ingredients to choose from. So, he had to be inventive and make a dish with what was available to him. Saffron, raisins, pine nuts, wild fennel and sardines fished from the Sicilian sea were what food history tells us he used to create this dish. Sicilian pasta with sardines and wild fennel is still made almost the same way hundreds of years later! Wild fennel grows all over Sicily. You can find it in the countryside, in ditches, along roadsides and even abandoned gardens! The peak season is during March. But, it’s possible to plant a bit in a pot and as long as you give it a little water you will be able to have wild fennel for months. However, spring is the traditional season to make Sicilian pasta with sardines! 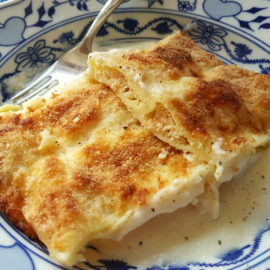 In fact, this is a very traditional dish on the feast of St Joseph (March 19th) and Good Friday. Instead of wild fennel, you can use normal fennel tops. The flavour isn’t as strong, but the dish will still be delicious. For more of a ‘fennel’ taste add some fennel seeds! Sardines used to be considered a fish with little value. In fact, they were used mainly as bait to catch bigger fish. They were also eaten mostly by the poorer people. In Sicily, there are a number of popular sardine based dishes such as ‘sarde al beccafico’, which I love. This dish is made by stuffing 2 flattened and filleted sardines and then baking them. Today, like Sicilian pasta with sardines, sarde al beccafico is considered a highlight of Sicilian cuisine. Despite their past reputation as poor quality food, sardines are actually very good for you. They are rich in vitamin D, vitamin B12, calcium selenium and proteins, as well as Omega 3. Obviously, fresh sardines are best for this recipe but you can also use canned sardine fillets. The traditional pasta for this recipe is bucatini or spaghetti. However, many people use penne or other pasta tubes. I used organic penne actually made with a heritage grain called Russello and wild fennel! This pasta was made in Sicily and sent to me by a company called US Italian Foods, based in New York. They sell this and other types of ancient grain organic pasta from Sicily in US and Europe. I know some people (not normally Italians) think pasta isn’t very healthy! But, there is pasta and there is PASTA. Mass produced pasta may not be healthy, especially if produced with flour made from GMO wheat that has been sprayed with poisons like the herbicide Glysophate! 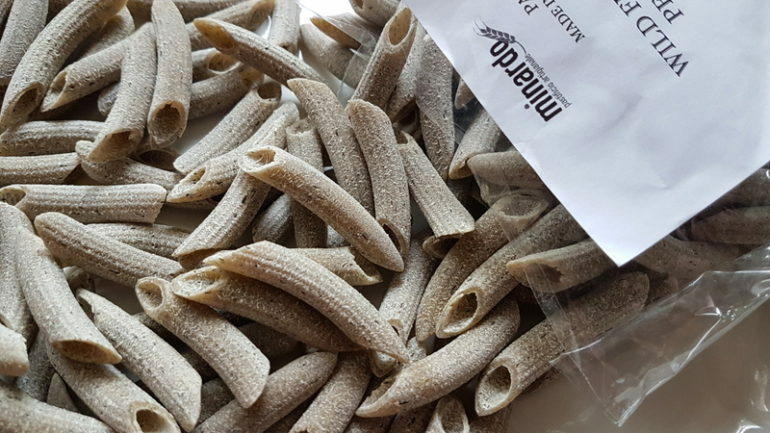 The wheat used in some Italian pasta is not always Italian. In fact, although the pasta on your supermarket shelves may be ‘made in Italy’, the wheat used is not always Italian! So, even though Glysophate is banned in Europe, some Italian pasta and a lot of foreign made pasta contain it! The good news is that there is lots of healthy pasta out there! This organic pasta made in Sicily with ancient grains is definitely good for you! In fact it is rich in protein, omega-3 fatty acids and antioxidants. Ancient grains, also called heritage grains, are types of wheat which haven’t been altered to produce higher yields. These grains lost popularity in the past as they have a lower yield and thus production costs are higher. Luckily, pasta and other wheat products made with heritage grains are becoming more and more popular again. This is because apart from being healthier, they are better tolerated by people who have problems with gluten! I didn’t have as much wild fennel as I would have liked to make this recipe. 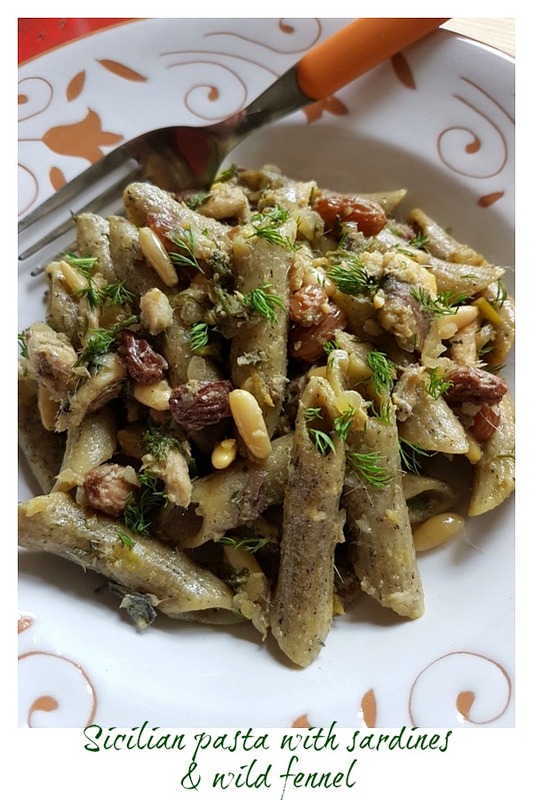 (I have a small plant in my garden) So, this wild fennel flavoured penne was perfect. Apart from having a wonderful firm consistency it really enhanced the fennel flavour in the dish. 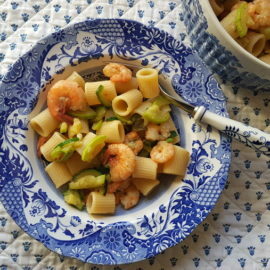 If you are thinking of making this recipe, this pasta would be such a good choice. You can check out US Italian foods website by clicking here. 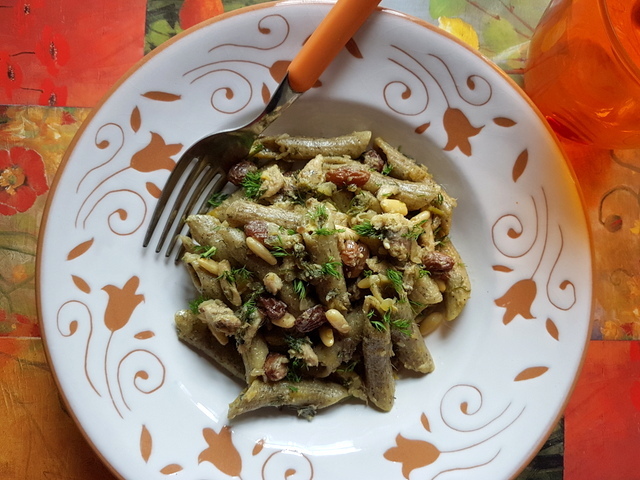 If you do try this Sicilian pasta with sardines recipe, I’d love to hear what you think. 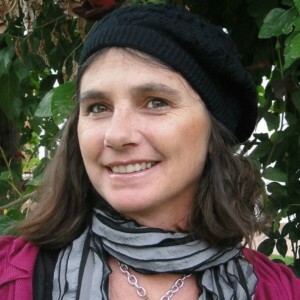 Please write a comment here on the blog or post a comment on the Pasta Project Facebook page. Bring a taste of Sicily to your table with this traditional Sicilian pasta recipe that dates back to 800 AD . This is a historical dish full of authentic Sicilian flavours. that you can easily recreate in your kitchen. First, soak the raisins in a bowl of warm water. Then soak the saffron in a small cup along with 3-4 tbsp warm water. Wild fennel is very easy to find in Sicily. But, if you don’t have wild fennel use the greenest and most tender parts of fennel tops. 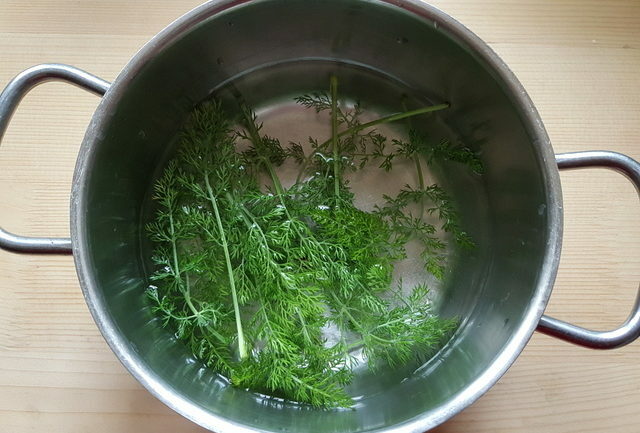 Remove the lower part of the wild fennel stalks and cook in boiling salted water for 10 minutes. Save the water and drain the fennel and put it into a bowl of iced water to preserve the colour. If you have fresh sardines, rinse them thoroughly and eliminate the scales by rubbing the body under running water. Open the stomach and discard the entrails. Finally, pull firmly and gently on the head to separate the meat from the backbone. Rinse the fish fillets again, dry them, and place in the fridge until ready to cook. Put a pot of water onto boil for the pasta. You can add the fennel water to it. Add salt once it starts to boil (less salt if using the fennel water) and bring to the boil again. Peel and chop the onion finely. Drain the fennel and chop it. Then put the onion in a frying pan or skillet with 3 tbsp of olive oi and the anchovy fillets. 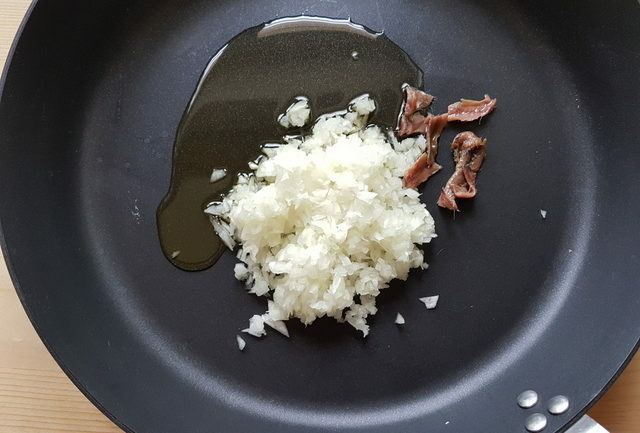 Sautè over a medium heat until the onions are translucent and the anchovies have melted. Rinse the raisins and add to the pan along with the pine nuts and the minced fennel. Cook 5 minutes more, then add the sardine fillets. Sautè 3-4 minutes stirring until the fish starts to fall apart. Do not overcook the fish. Finally, add salt as needed and another splash of olive oil. Cook the pasta al dente according to the instructions on the packet. Drain and mix with the sardine sauce. Serve immediately with toasted breadcrumbs if required. Many Sicilians dress this dish with toasted breadcrumbs which is a traditional addition to seafood pasta dishes instead of cheese. You can make this dish with normal fennel tops and canned sardines if you don't have wild fennel or fresh sardines available. If you live in US and are interested in trying some organic Sicilian ancient grains pasta check out the US Italian Foods online shop. Use the coupon code THEPASTAPROJECT and get a 10% discount! You can thank me later! I haven’t been compensated for writing this article and all opinions are my own but I may be compensated if you buy products through this link. However, this helps me cover my blog costs and keep it going! Pasta is my go to during the week for the perfect comfort food with the family! We always try to switch it up every week, and this week I NEED to try out this recipe. My Husband’s little Italian Grandmother used to make him Pasta Con Sarde. He talks about it to this day but the recipe was pretty basic. 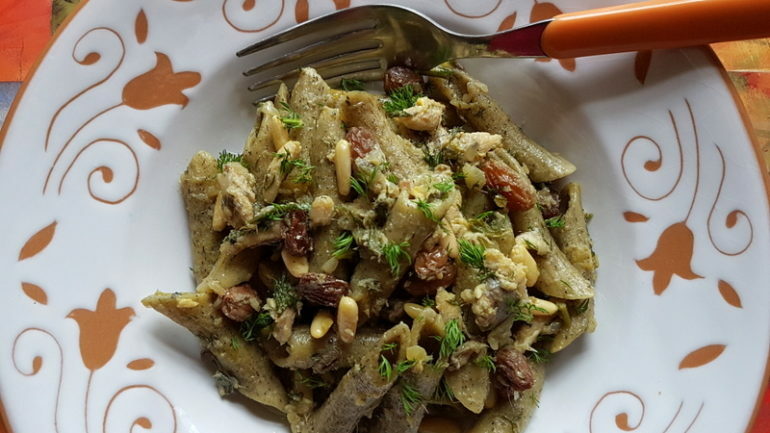 Your recipe with the wild fennel, pignolis and raisins sounds AMAZING!!! I’m going to make this for him to bring him back to his childhood. Thank you for sharing. So glad you want to make this pasta con sarde Susan! I made it for my Sicilian hubby and he was sooo happy!! This pasta dish looks so comforting! I love sardines and this is perfect for lent! Thanks Beth! Yes, this is a great Lent recipe. In fact, in Sicily it’s traditionally eaten on St Joseph’s day (March 19th) and Good Friday! I’m told to eat a lot more sardines and anchovies these days (the best omega 3’s you can put in your mouth!) so this dish will work wonderfully! I might use gluten-free pasta but it will taste just as good! I’m sure gluten free pasta will be just as good Lesli! The pasta I used was organic and made from heritage grains. Even this pasta is tolerated better by people who have problems with gluten! 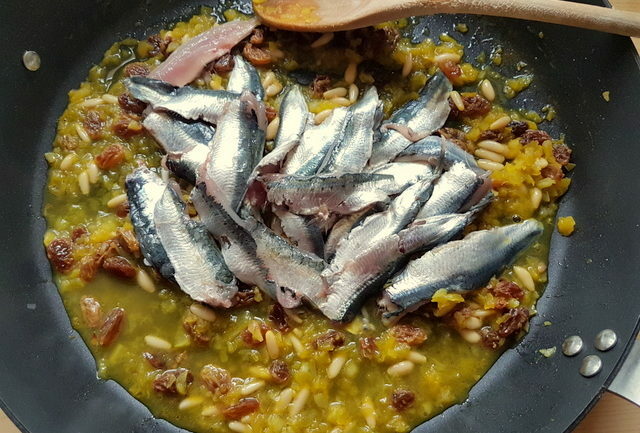 I’ve actually had this on my list to try for a while – I’ve made the similar dish “pasta con sarde a mare” which is much the same without sardines but have been waiting for fresh sardines to be available to try this. Great to now have a recipe to follow too! Thanks for your comment Caroline! 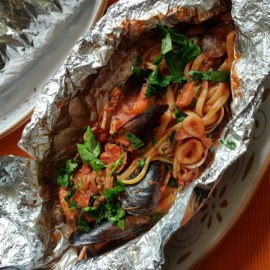 I also want to make the version without sardines, just love the name pasta con sarde a mare ( with sardines in the sea!) I hope you’ll get some fresh sardines and make this version. It’s delicious! That sounds heavenly, I love sardines and they are great with that aniseed flavour of fennel. Love the idea of the raisins in the sauce too! Thanks so much Brian! Yes sardines go so well with fennel! 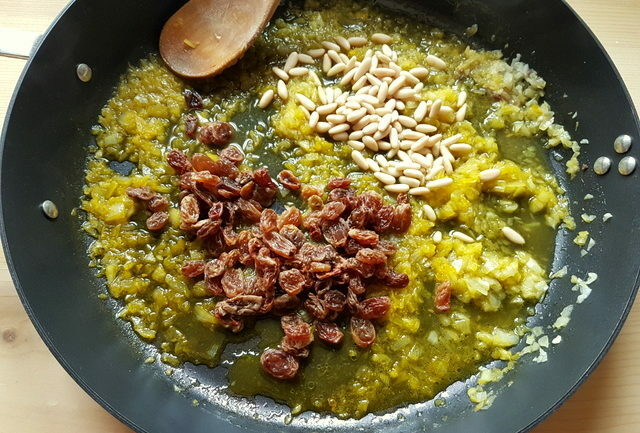 Using raisins, saffron and pine nuts is very traditional in Sicily, especially in the Palermo area! Dates back to the Arab occupation hundreds of years ago! I like the combination of sweet and salty. I’ve never tried this particular pasta dish but I’d like to. 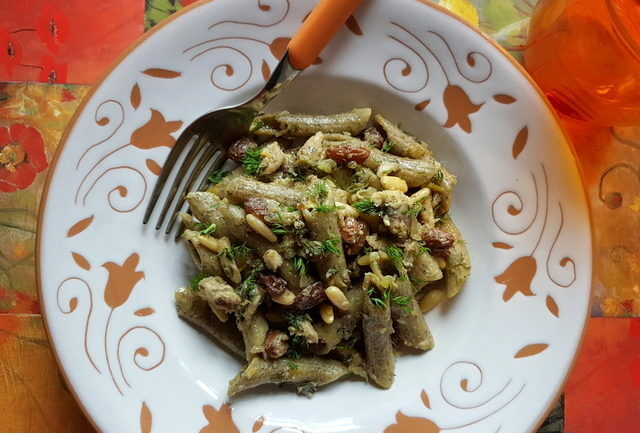 I’m sure you’ll love this pasta with sardines Jill! The use of sweet and savoury is very popular in Sicily. Italians say ‘agrodolce’. I love it too! I basically grew up on sardines, it is common in European diet. I don’t think they are as much popular in North America as in Europe. I grew up on sardines too Ilona, although mostly canned. Nothing beats fresh ones though! So tasty and good for you. This pasta with fresh sardines is definitely worth trying! Looks really good! I love all the wild fennel, I bet it has such an amazing flavor! Thanks Kate! Yes wild fennel has a fabulous flavour. I have a little plant in my garden but wish it grew wild here like in Sicily! Oh wow this is unique and such a good looking dish. While I don’t eat sardines often, I do get a hunkering for them on occasions and this looks like the perfect recipe. Thanks so much Ben! Yes this is a fabulous dish! I’ve eaten it so many times in Sicily. I’m sure you’ll love it if you try it! Oh this sounds so good and I love all the history surrounding this dish! It would be so wonderful to have wild fennel growing everywhere! Grazie Pam! I love these ancient recipes with history! So interesting that some dishes (like pasta with sardines) have been made the same way for hundreds of years! I have a wild fennel plant in my garden, but I also wish it grew wild here too! I’ve never tried sardines..this dish looks intriguing! My husband is always on me about getting more sardines into my diet, so this is perfect! Looks like such a flavorful and healthy dish. I love the fascinating history of food, and where the origins of dishes comes from. Amazing that we still use the same kind of recipes to make delicious meals today. This sounds like a lovely mix of ingredients for a real family meal to enjoy together. Such a rich and decadent recipe! I’m always looking for delicious ways to get my omega3s in and this is delicious!